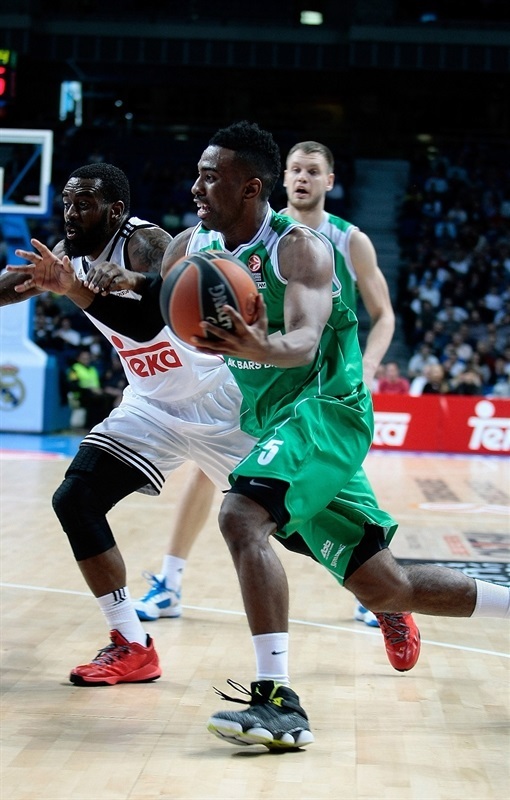 Unics Kazan sent a message that echoed all around the Turkish Airlines Euroleague by downing Real Madrid 75-85 in the Spanish capital on Thursday. 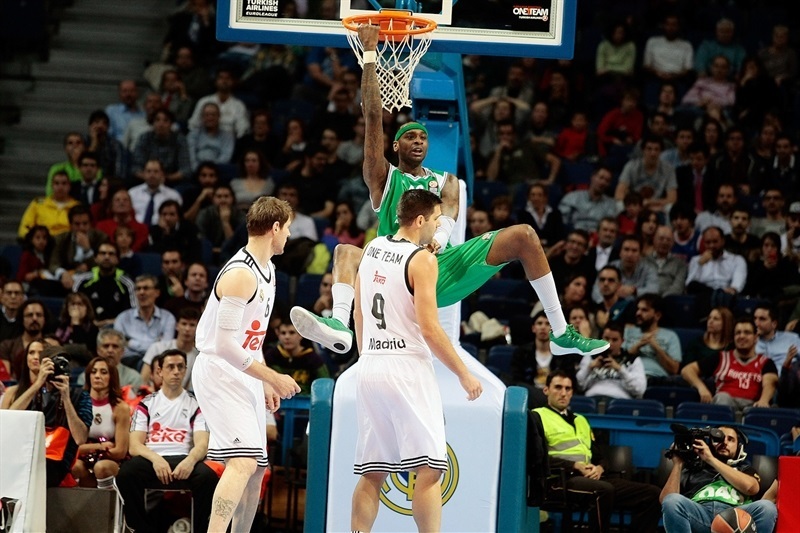 Unics improved to 3-4 and broke Madrid's 21-game home winning streak in the Turkish Airlines Euroleague. Madrid dropped to 5-2. D'or Fischer took over against his former team and led the winners with 25 points, 8 rebounds and 5 blocks. 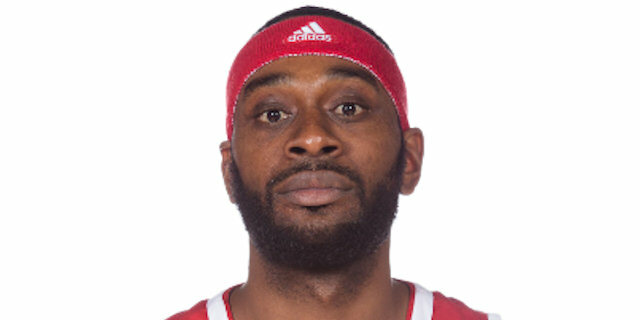 Curtis Jerrells added 23 points, 8 rebounds and 5 assists, Keith Langford had 14 points while James White got 11 for Unics. 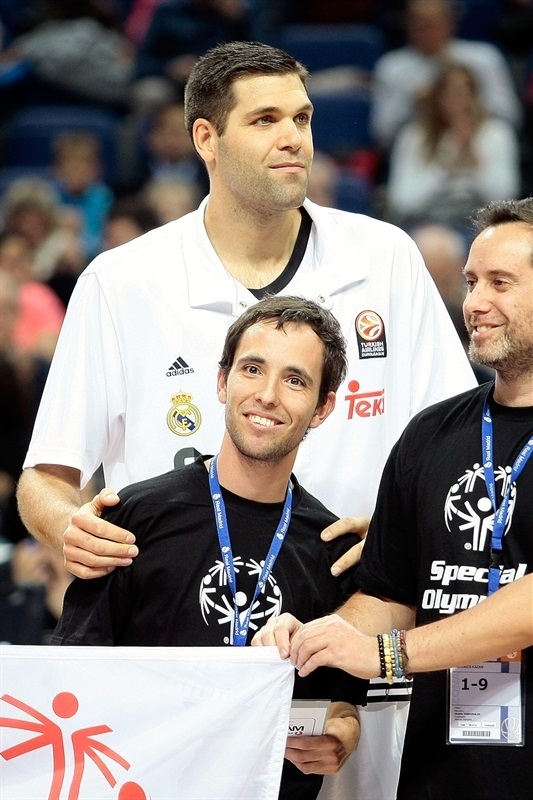 Sergio Rodriguez led Madrid with 12 points. Andres Nocioni added 11 while Gustavo Ayon had 10 for the hosts. Fischer shined in the first quarter, scoring 12 points in the opening six minutes. He got help from Langford and James White to get a 12-21 lead. Rodriguez and Ayon brought Madrid within 22-23 after 10 minutes. A 10-0 run that Jonas Maciulis capped with a fast break slam gave the hosts a 37-28 margin. Jerrells and Fischer brought Unics within 46-42 at halftime. Unics rolled after the break behind an outstanding Jerrells, who got help from Zisis and Fischer to lead 61-68 through three quarters. Jerrells kept pushing Unics in crunch time and a layup by Langford sealed the outcome, 70-83, down the stretch. 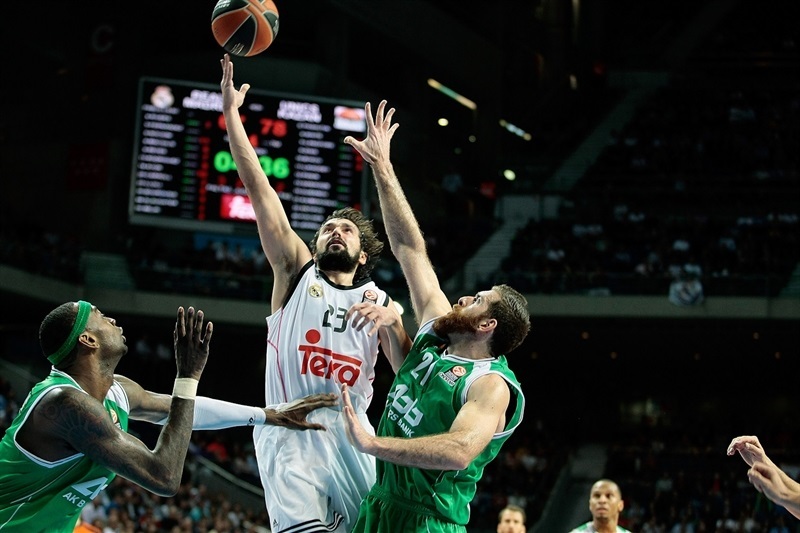 Ioannis Bourousis got Madrid going with a three-pointer from the top of the key. Langford sank a one-handed floater off the baseline and a mid-range jumper by White gave Unics its first lead, 3-4. Jaycee Carroll took over with a running jumper in the lane, but back-to-back baskets by Fischer gave Unics a 5-8 edge. Nocioni banked in a mid-range shot, but an unstoppable Fischer and Langford fueled a 0-7 run that boosted the guests' lead to 7-15. Sergio Llull struck from downtown and Ayon added a jump hook, but Fischer - 12 points in six minutes - kept Unics way ahead, 12-19. Langford hit a jumper, but K.C. Rivers downed a triple and Sergio Rodriguez fed Ayon for a fast break dunk after which Unics called timeout at 17-21. 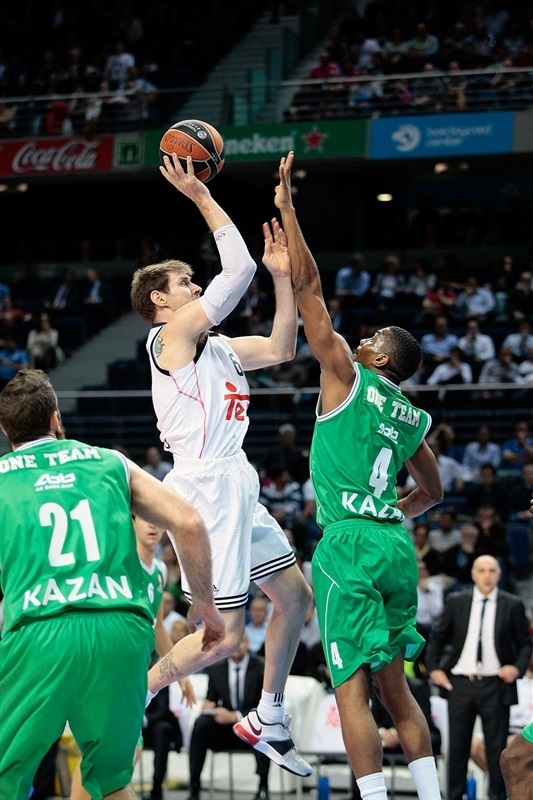 Sergey Bykov hit free throws, which Felipe Reyes bettered with a layup-plus-foul. Rodriguez fed Maciulis for a layup that brought Madrid within 22-23 after 10 minutes. Maciulis kept pushing Madrid with another layup early in the quarter. Langford split free throws and a three-point play by Rodriguez put Madrid back ahead, 27-24. Curtis Jerrells scored in penetration and Langford copied him right after that for a 27-28 Unics edge. 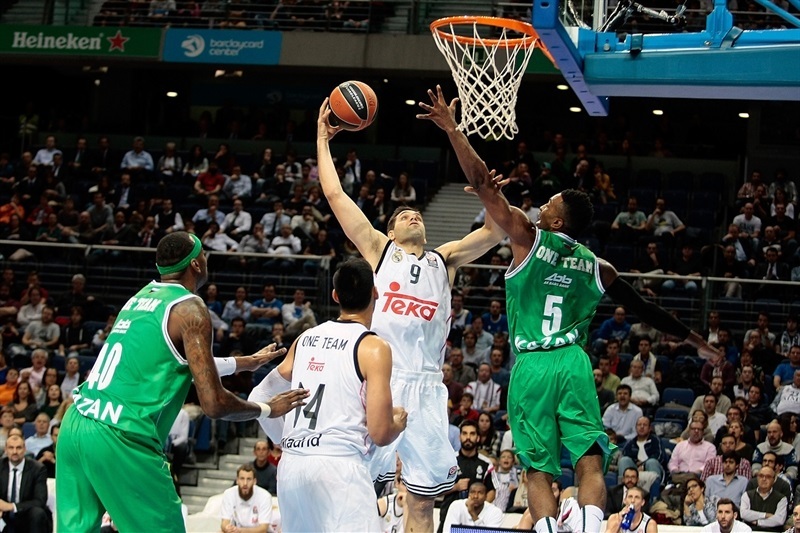 Salah Mejri hit a jump hook and Rodriguez found Reyes for a layup and a 31-28 Madrid edge. Reyes scored again and a dunk by Mejri ignited the crowd. A dunk by Maciulis forced Unics to call timeout at 37-28, after a 10-0 run. White shined with an alley-oop layup and a free throw by Fischer brought Unics closer, 37-31. White scored around the basket and Fischer added a jumper, but three-pointers by Llull and Nocioni gave Madrid a 43-35 margin. Rodriguez and Jerrells joined the three-point shootout and a jumper by Kostas Kaimakoglou kept Unics within 46-40. A buzzer-beating jumper by Jerrells fixed the halftime score at 46-42. Jerrells shined with a big basket immediately after the break and a jumper by White tied it at 46-46. Bourousis scored down low, but back-to-back mid-range jumpers by Fischer gave Unics the lead, 48-50. 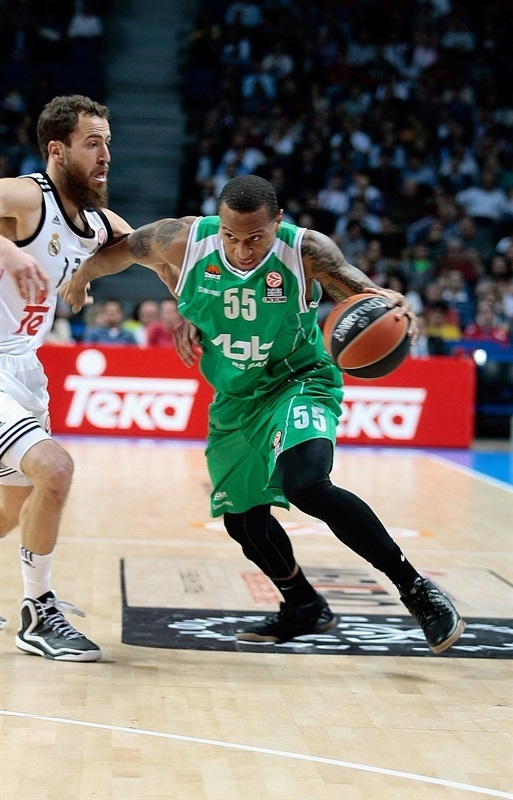 Jerrells struck from downtown, as Madrid kept struggling to score. The hosts found a go-to guy in Ayon, who took over with a layup off a steal. Jerrells nailed another triple, but a layup by Reyes kept Madrid within 52-56. 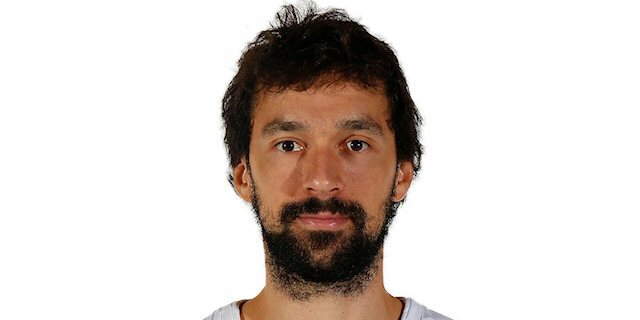 Llull ignited the crowd with a coast-to-coast layup, which a red-hot Jerrells erased with an off-balance six-meter shot. After White fired one from beyond the arc, Ayon scored around the basket and a driving layup by Nikos Zisis gave Unics a 56-63 margin. 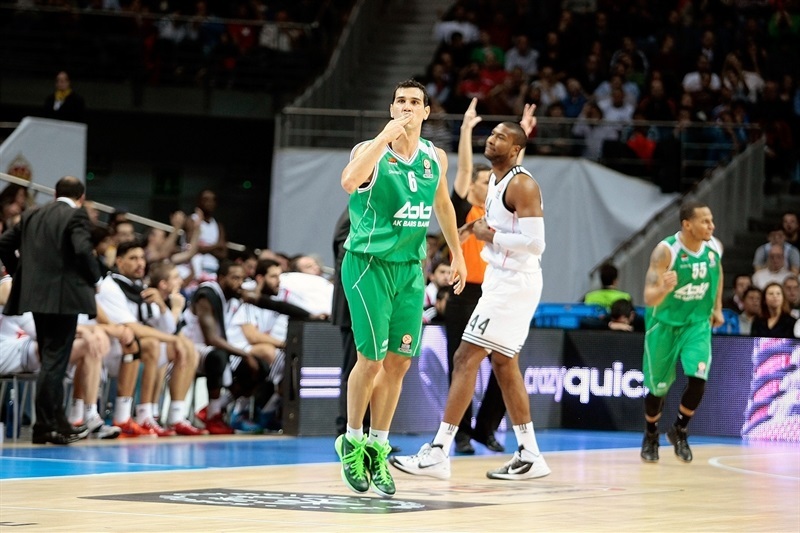 Nocioni hit free throws, but Zisis kept Unics going with a catch-and-shoot three-pointer. A wild dunk by Fischer made it a double-digit game, 58-68. 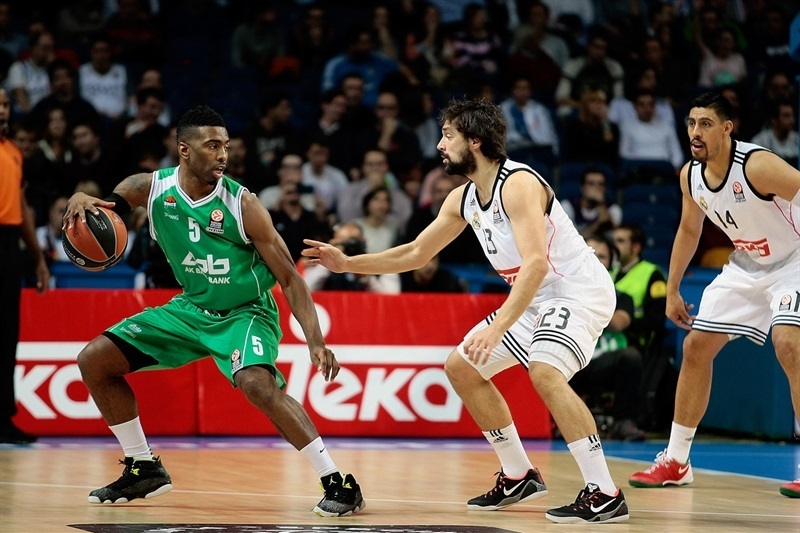 A buzzer-beating triple by Rodriguez kept Madrid within 61-68. Both teams struggled to score early in the quarter until Nocioni stepped up with a put-back basket. Fischer dunked again and erased Nocioni's off-balance basket with a jumper that restored a 7-point Unics lead with over six minutes left. Madrid could not find the way to the basket despite powering the offensive glass really well. Meanwhile, a three-pointer by Jerrells gave Unics a 65-75 lead. Marcus Slaughter and Reyes made free throws, but Zisis and a red-hot Jerrells struck from downtown to boost the guests' margin to 68-81 with four minutes left. 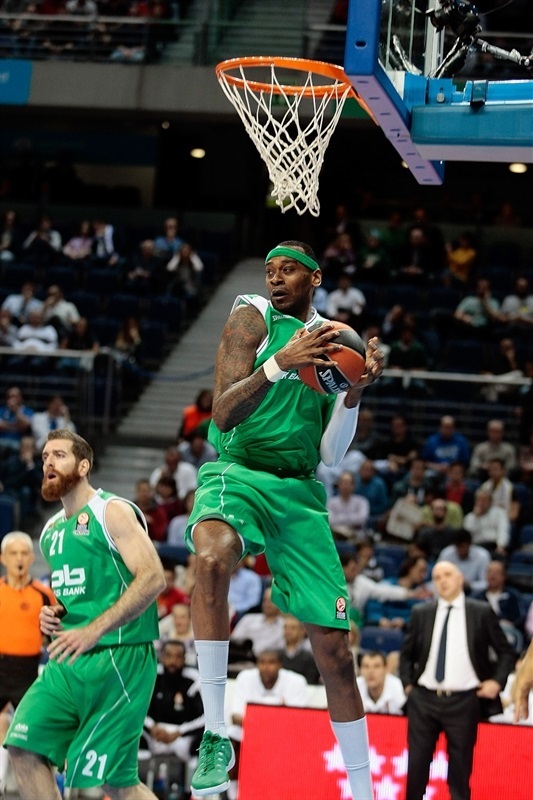 Reyes found Slaughter for a layup, but Langford scored in penetration for a 70-83 Unics lead. Rodriguez nailed a three-pointer and Carroll added free throws, but everything was said and done as Unics had cruised to a critical road win. "We trailed almost all the way. Unics had a great shooting night, especially in the third quarter. In those moment, every three-point shot was an added problem for us. When we wanted to give more, it was too late to do that and we could not come back. Congratulations to Unics, the clear, fair winners of this game. Sometimes the best lessons come from losses. Even when we didn't lost a Euroleague game in here since March 2013, this loss should not change anything. We have to improve a lot of things and I would say that if we had won, too." "It was a crucial game for us. Every win, in our situation, is like winning a final in this race to reach the Top 16. We played a great game and that is the only way to win in a place like this. The key was playing at a slower pace than Madrid usually plays. We managed to do it in the first quarter, but not in the second. We played a good third quarter, really focused on controlling the game rhythm. We also managed to be really effective from beyond the three-point line. That helped, but our win was based on good defense. This is an amazing win for us because we beat Real Madrid, one of the strongest teams in Europe. We were able to keep control defensively and offensively, not taking quick shots, sharing the ball and playing smart. I congratulate my guys and now we have more chances to qualify to the Top 16. It is a big win for me, too, I never beat Madrid before, it is the first time in my career. We have to improve and move forward to the Top 16." "Everything went wrong for us. We didn't play good defense and did not move the ball well on offense and you cannot do that against a team like Unics. You cannot let them feel comfortable and let them play because they have a lot of talented teams, who played well and beat us. It was balanced game but there was a certain moment in which we missed 3 consecutive shots, they scored a couple of three-pointers and got away. We have to learn from this and keep working hard to avoid this to happen again. Unics is a dangerous team even when they lost many games they should not have lost, especially at home. We didn't have a good day and didn't play at the level we should give to win this game." "We really needed this win if we wanted to keep fighting to reach the Top 16. We won after playing a great game in one of those toughest courts to play in Europe. We have three wins now but need to keep winning. We must win at home next week to make this one count and stay alive in the race to make it to the Top 16. Personally, I am really happy because I needed a game like this in my return to Madrid."